Five years ago, we did a list of good wintertime hikes ranging from easy nature trails to fairly strenuous hikes. It remains one of our most-read blog posts ever. Visitors to the Blue Ridge mountains near Asheville, NC, want to know good places to hike in winter (and the other three seasons as well). So why not add more to our list of seasonal favorites? In this new set of hikes below, we’ve included a number of waterfall trails, since wintertime waterfall viewing is pretty awesome. Also, we included trails that may have interesting things to see beyond wildflowers and verdant views that you see at other times of the year. Please do take note that many of the trails in our area are “rooty and rocky,” with lots of tree roots and small or medium-sized rocks in your path, which can be slippery in rainy or snowy conditions. These mountains are the oldest on earth and part of a diverse and beautiful landscape! They have a distinct personality for each season. But they don’t care if you slip and fall. We do, however, so please take care when hiking in the wintertime. Also, dress in layers, don’t forget to take water, watch the forecast, and be aware, before you go, of any road closures due to wintry weather. Here are ten more good hikes for wintertime in our neck of the woods, in alphabetical order. Bent Creek Trail (North Carolina Arboretum) – The North Carolina Arboretum features more than 430 acres of public gardens in a natural setting near the Blue Ridge Parkway, southwest of Asheville. Included are ten miles of hiking and biking trails in the beautiful Bent Creek area. One of the trails, the aptly-named Bent Creek Trail, is for hiking only and leads along the creek for 1.3 miles. It also parallels Bent Creek Road, a wide gravel pathway for use by pedestrians (and pooches) and cyclists. We prefer the Trail. Cascade Glen Trail via the Lee Moore Trail (Christmount in Black Mountain) – Attracting many visitors to our area are various conference centers around Black Mountain. Not only do these conference centers host different events, but many of them have hiking trails open to the public. One is Christmount, located just south of downtown Black Mountain, NC, off of NC Hwy 9. Christmount has numerous trails, including the Cascade Glen Trail, a half-mile moderate trail accessed via the Lee Moore Trail. So, two trails in one! See trail map and description here. Catawba Falls (Old Fort) – Catawba Falls is a great year-round trail. It is extremely popular in warm weather months, so the decrease in crowds in the off-season is one reason it has made its way on to our wintertime list. The trail is approximately 3 miles roundtrip, meandering along the headwaters of the Catawba River (and past the very cool ruins of a hydroelectric dam) and leading to the base of Catawba Falls. One note: We do not recommend that you try the steep section to the top of the falls, especially in wintertime. Lower Piney Trail (Montreat) – The town of Montreat has a fantastic trail system with more than 20 hiking trails, which are a nice alternative to trails on the Blue Ridge Parkway that are not easy to get to in the winter. The Lower Piney Trail can be accessed from either the north or south ends of the trail via roads, and is just under 3 miles out and back. There is a view about halfway down the trail. We have Montreat trail maps here at the Inn for guests to use. Parris Creek Fire Road (Pisgah National Forest 1/4 mile from the Inn) – There are two Forest Service access roads a quarter mile from the Inn on Mill Creek B&B. No motor vehicles allowed, but the grassy/gravel roads make great hiking trails. The Parris Creek Fire Road is on the west side of Mill Creek Road and leads into Pisgah National Forest for well over a mile, on a gradual incline. 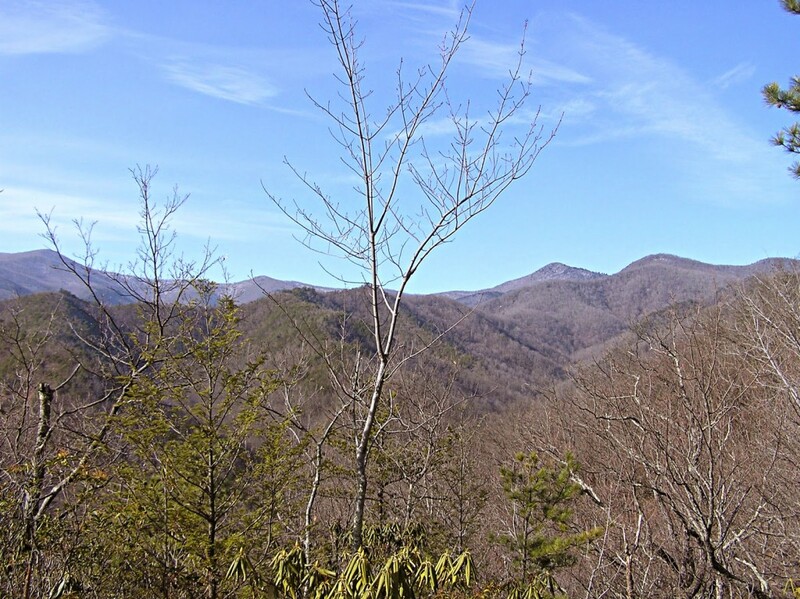 It rounds a bend to lovely views of the ridges between the Inn and Montreat. Rainbow Road (Montreat) – One of many easy trails in Montreat, Rainbow Road features tunnels of evergreen rhododendron following an old roadbed through deciduous forest. It’s an easy 2 miles out and back to the trailhead off Lookout Road in Montreat. For something more strenuous, try Lookout Mountain or Rainbow Mountain, but be very careful if hiking those steep trails in the wintertime. Check with us when you stay at the Inn on Mill Creek for area trail maps, including Montreat. Roaring Fork Falls (Pisgah National Forest north of the Blue Ridge Parkway) – Located not far off of Highway 80, just north of the Blue Ridge Parkway is the Roaring Fork Falls Trail, taking hikers on an old Forest Service access road along Roaring Fork, a tributary to the South Toe River, to the base of a pretty awesome waterfall that zig-zags down through the forest. See a trail description here. Ruins Trail (Warren Wilson College) – Warren Wilson College in Swannanoa has its share of beautiful hiking trails, including the Ruins Trail, part of a network of trails that were actually roads in the years following the Revolutionary War. This trail in particular, which branches off of the Davidson Road Trail, has ruins of old homesteads and even an old inn. Toms Creek Falls (Marion) – Toms Creek Falls, not far off of Highway 221, east of the Inn on Mill Creek B&B, is a very well maintained trail through forested land and along Toms Creek. The trail’s namesake is a rather nice waterfall that cascades steeply down more than 60 feet over rocks. An observation platform is under construction at the base of the falls, and you can hike to the top via a moderate trail to the right of the falls. There’s also an old mica mine to the left of the base of the falls. For more details, see our recent blog post on Toms Creek Falls. 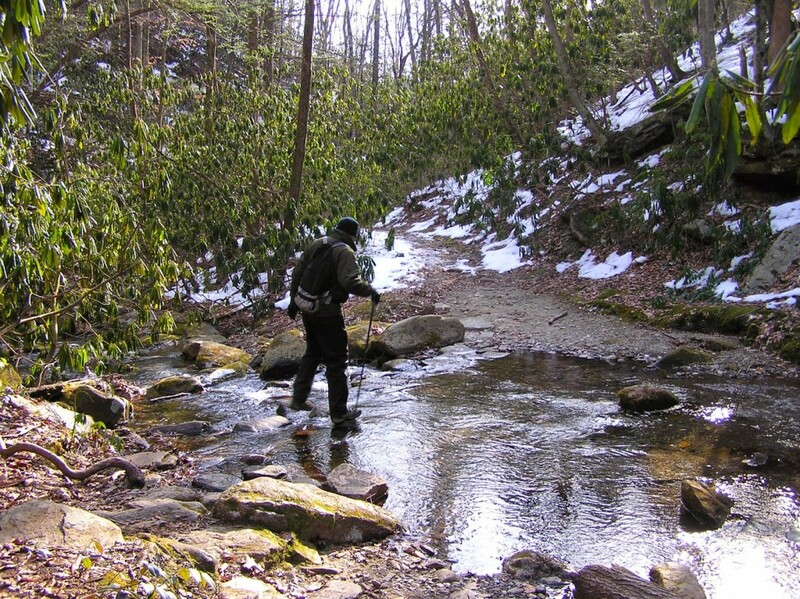 Youngs Ridge (Old Fort) – Last but not least in our winter hike lineup is Youngs Ridge, a 4-mile (one way) moderate trail through Pisgah National Forest south of the Inn on Mill Creek B&B. We recommend accessing the trailhead that begins in the Old Fort Picnic Grounds, a short drive from the Inn. The picnic grounds themselves are closed in the wintertime, but you can park outside of the gate at the intersection of Mill Creek Road and Old US Hwy 70, and then walk through to the trailhead, which is on the left side of the picnic grounds. Keep an eye out for mountain bikers on this trail, especially on weekends. 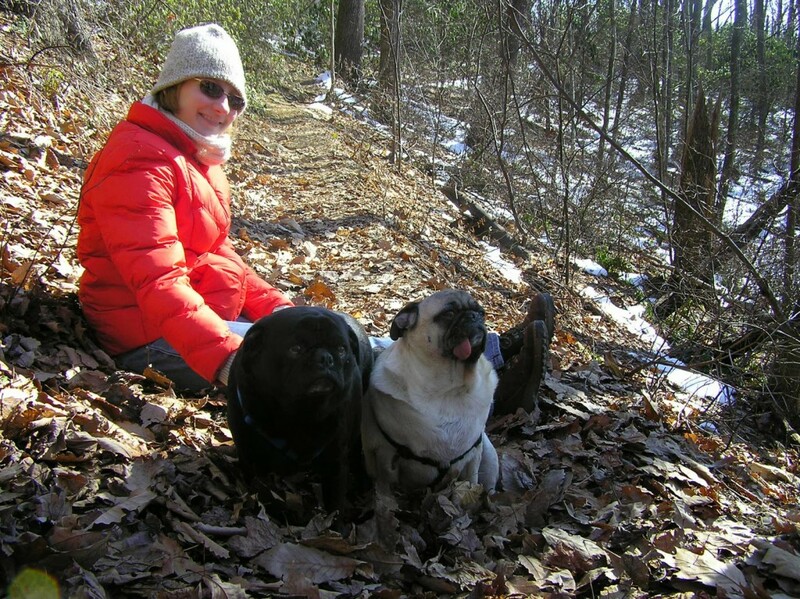 Innpugs from a winter past…wondering why we’re sitting and not hiking! This entry was posted in Hiking and Waterfall Trails and tagged hiking, Winter by Inn on Mill Creek. Bookmark the permalink.